Finding the right place to buy a family home can be difficult. Families with more than one child need enough space to live comfortably. But larger homes can be tough to find, especially large homes which are affordable. Below SmartAsset looks at these and other factors to find the best cities to buy a home big enough to raise a family. Looking to buy a home? Check out current mortgage rates. In order to rank the best cities to buy a home big enough to raise a family, SmartAsset looked at data on six metrics. We looked at the 5-year change in median home values, 5-year change in median rent costs, average effective property tax rate, the percent of houses which have at least two bedrooms, median housing cost as a percent of income and the percent of homeowners who are housing cost-burdened. Red-hot Arizona homes – Homes in Arizona have appreciated faster than homes almost anywhere else. In particular homeowners around the Phoenix metro area – in cities like Chandler, Gilbert and Scottsdale – have seen their home values increase by over 40%. This makes it a great spot to be a homeowner. Combine that with the large number of multi-bedroom homes and you have a great market to find a family home. Bigger cities tend to be worse – Los Angeles, Chicago and New York all rank in our bottom 20. In general, these places to tend be full of smaller apartments and lack the space a family may want for the family home. 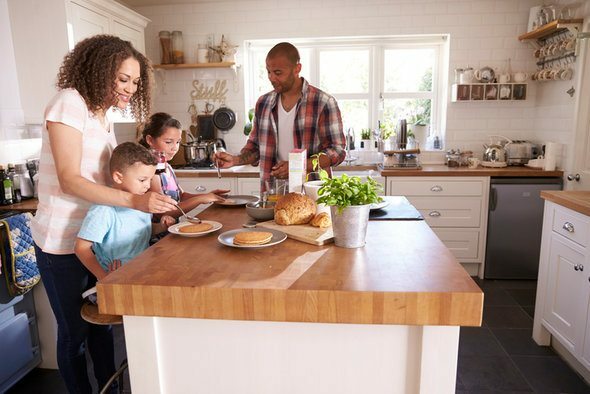 Buying may not always be better – While raising a family you may want to own your home so that you are in complete control of your living situation. However, financially speaking, owning may not always be the best idea in every city. In some Midwest cities, namely Cleveland, Milwaukee, Detroit and Cincinnati, home values dropped from 2011 – 2015. 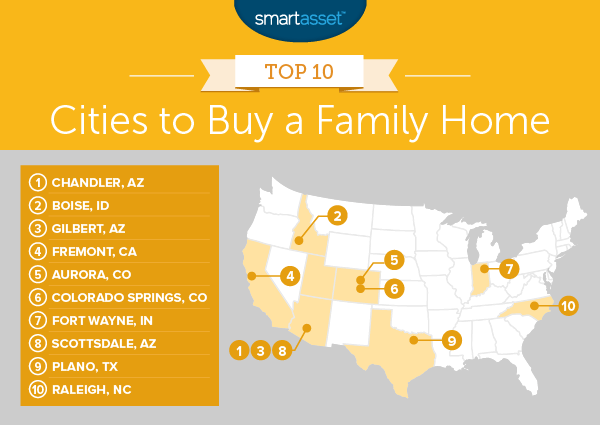 According to our data, Chandler – a large city in the Phoenix metro area – is the best city to buy a family home. Our data shows that from 2011 to 2015 the median home value increased by a whopping 45%. While that trend may not continue at such a breakneck pace in the future it is still a good sign for potential homeowners. Other than appreciating home values, the housing stock here is also favorable for people family-home hunting. Our data shows that over 91% of homes in Chandler have at least two bedrooms. For both metrics, home appreciation and percent of housing stock with at least two bedrooms, Chandler ranked in the top 10. For families who prioritize affordability when deciding where to lay down roots, Boise is a great option. Our data shows that the median home costs only 20% of the average household’s income, fifth-lowest in our study. Plus, only 19% of mortgage owners are housing cost-burdened (i.e. they spend over 30% of their incomes on their mortgages). 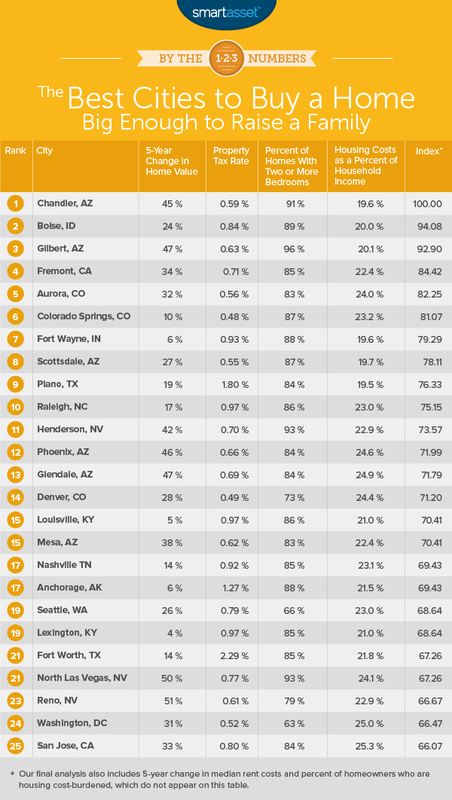 The second of three Arizona cities to crack our top 10, Gilbert scores well in many of the same metrics Chandler did. Home values in Gilbert are rocketing up. The average home increased in value by just under 47% from 2011 to 2015. Gilbert also has the largest portion of its housing stock which is built with families in mind in the study. Over 96% of homes here have at least two bedrooms. Fremont renters got the short end of the stick compared to homeowners. Our data shows that median rents rose about 25% from 2011 to 2015, one of the highest rates. At the same time, home values rose 34%. Hopefully those families in Fremont who decided to rent instead of buying put some extra money in their 401(k) since they missed out on appreciating home values. Fremont also has low property taxes, just like most of California, which lowers the cost of owning compared to other cities. One concern which may linger in the back of Fremont families’ minds is affordability. Just under 30% of homeowners here are housing cost-burdened. Aurora is the first of two Colorado cities to crack this top 10. Like much of Colorado, home prices here are surging. From 2011 to 2015 the value of the median home grew over 32%. At the same time rents also shot up 22%, meaning households here are better off buying vs renting, especially if they plan on staying for the long haul. Property taxes in Colorado are also low. According to our data, the average effective property tax rate in Aurora is only 0.56%, the seventh-lowest in our study. Colorado Springs benefits from the same low property tax rates as Aurora. According to our data, the average effective property tax rate in Colorado Springs is 0.48%. That is the second-lowest in our study. But low property tax rates are not the only reason to own in Colorado Springs. According to our data, monthly rent costs are rising faster than home values. This means renting from year-to-year in Colorado Springs is becoming less affordable for families. Fort Wayne takes seventh largely due to its affordability. This city has the smallest proportion of families who are housing cost-burdened. The reason for that is the low housing costs compared to the incomes residents make. According to our data, the average household only needs to spend 19% of their income to keep a roof over their heads. The other good news is that if you are a family shopping around for a home in Fort Wayne you will have plenty of family-friendly options. According to our data, just under 88% of homes here have at least 2 bedrooms. Scottsdale combines rising property values (up 27.25% from 2011 – 2015) with low property tax rates (0.55%) to make for a great place to buy a family home. Make sure you don’t take out a mortgage you can’t afford, however. Our data suggests some people in Scottsdale may have bought more home than they could afford. According to our data, just over 33% of homeowners here are housing cost-burdened. Plano homes are the most affordable relative to income in our study. Data from the Census Bureau shows that the average Plano household makes over $83,000 per year while the average home costs $16,300 per year. That means if the typical household bought the typical home they would need to only spend 19.5% of their income on housing. Most households also manage to make their monthly mortgage payments relatively pain-free. According to our data, only 25% of homeowners dedicate over 30% of their income to home payments. Raleigh takes our final spot. Home values here are up about 16% from 2011 to 2015 while average rent costs are up a similar amount, on average. That pushes the argument for renting or buying in Raleigh well on the side of buying. Raleigh is also relatively affordable for the people who live there. According to our data, Raleigh ranks in the top third for all of our affordability metrics. 5-Year change in median home values. This is the percent change in median home values. Data comes from the Census Bureau’s 2015 and 2011 1-Year American Community Surveys. 5-Year change in median rent costs. This is the percent change in median rent costs. Data comes from the Census Bureau’s 2015 and 2011 1-Year American Community Surveys. Average effective property tax rate. Data comes from the Census Bureau’s 2015 1-Year American Community Survey. Percent of homes with at least two bedrooms. Data comes from the Census Bureau’s 2015 1-Year American Community Survey. Median housing cost as a percent of median income. This is median housing cost divided by median household income. Data comes from the Census Bureau’s 2015 1-Year American Community Survey. Percent of homeowners who are housing cost-burdened. This is the percent of homeowners who spend over 30% of their income on housing costs. Data comes from the Census Bureau’s 2015 1-Year American Community Survey. We ranked each city in each metric. After, we found each city’s average ranking, giving equal weight to each metric. We used this average ranking to create our final score. The city with the best average ranking received a 100. The city with the worst average ranking received a 0. While the idea of buying a spacious house for your family sounds great, you need to make sure you can afford it. A mortgage is a two-way street, meaning both the lender and the borrower need to agree to the terms. Lenders have different thresholds for determining how much to loan, but a good rule of thumb is your total debt payments will equal 36% of your pre-tax income. That means lenders take into account your student loan debt, credit card debt and any other outstanding obligations when deciding how much to loan. There are two other numbers which come into play when deciding large of a loan you can take out: the length of mortgage and the mortgage rate. The length of loan is something you can decide. A longer mortgage, usually a 30-year mortgage, means lower monthly payments but more total interest paid. A shorter loan, say a 15-year mortgage, means higher monthly payments but less total interest paid. When a lender is deciding the interest rate for your loan they look at your credit score. The difference between a bad credit score and a good score can mean tens of thousands of dollars over the course of the loan. In fact, a credit score below 620 may mean you are unable to get a mortgage at all. There are other factors which determine whether or not you can afford your mortgage which the lender cannot help you with. For example, are you thinking about leaving your job or concerned you may not make as much today as you will tomorrow? Those are questions you need to answer for yourself. You do not want to be in a situation where you income takes a hit and you can no longer afford your monthly mortgage payments.